For the last year, Cameron Benedict, a welding engineer with Fabrisonic has been stationed over in Kuwait and Iraq. First Lieutenant Benedict has been a part of the Ohio Army National Guard since 2011. He was deployed in support of Operation Spartan Shield and served as the Executive Officer for the 1194th Engineer Company. The 1194th EN CO is a vertical engineering company designed to support construction operations regarding plumbing, electrical, and rough carpentry. We are happy to have Cameron back in the mix safe and sound and adding new ideas as he jumps back in to the 3D printing realm at Fabrisonic. 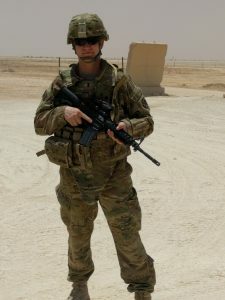 1LT Benedict flew to Iraq to serve as the unit’s HAZMAT shipment certification officer.